University of Florida Herbarium (FLAS) collections are being cataloged under several projects. Specimens records are available through a variety of portals. At present approximately 25% of our collections are cataloged. The University of Florida Herbarium Collections Catalog is a searchable database of ca. 87,000 of the 470,000 herbarium specimens in the collections. This catalog includes mostly vacsular plants, with some bryophyte and lichens, and all types for those collections. 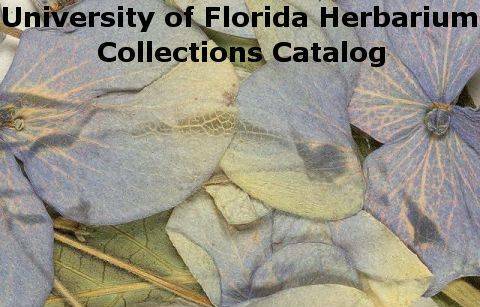 The catalog is cross-linked with the University of Florida Herbarium Type Specimens Catalog where type details such as basionym and bibliographic data are provided. Digital images (ca. 50,000) are available for selected specimens. The images are integrated with the catalog and are also available through a custom search page. A common name search tool provides a walkway to the scientific names used in the catalogs. Type specimen data and high resolution images are also being added to the JSTOR Global Plants web site with support from the Andrew W. Mellon Foundation and collaboration with JSTOR. Images for our bryophyte types are currently only available through this web site. This work was supported under NSF Award #1206394: "Digitization PEN: Digitization of North American Bryophyte and Lichen Specimens from Florida Herbaria." The award was made as part of the Lichens, Bryophytes and Climate Change NSF Thematic Collections Network project under the National Resource for Digitization of Biological Collections through the Advancing Digitization of Biological Collections program. The project web page provides more details on the progress of this project. The algal collection is cataloged in the Macroalgal Herbarium Portal. This work was done by Carol Ann McCormick and staff at the University of North Carolina Herbarium with support by a grant from the National Science Foundation. The UF Mycological Herbarium is participating in an NSF-funded project to digitize and database as many US macrofungi collections as possible. This project (The Macrofungi Collection Consortium) includes 34 institutions in 24 states. The project began in July 2012 and will aim to capture data for roughly 1.3 million fungal specimens. All of our cataloging data is also available through the national resource iDigBio.org.